[2019-03-29] 2018 CIMO Guide with Two Cryosphere Chapters. The Preliminary 2018 Edition of WMO-No. 8, Volume II, Measurement of Cryospheric Variables is available. Chapters 1 and 2 have been written and will be part of the 2018 Edition when finalized. Chapters 3-8 will be developed during the GCW pre-operational phase, tentatively scheduled for 2020-2023. 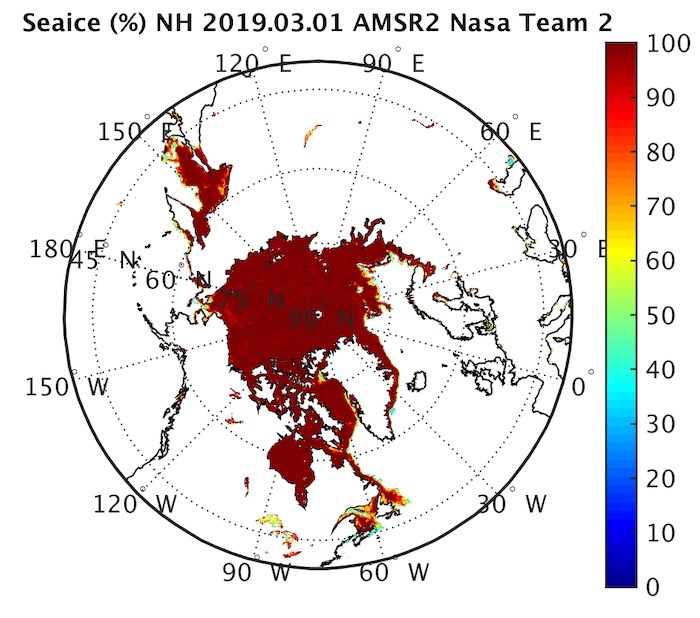 [2019-03-07] Read about current sea ice conditions in the 2019 sea ice assessment. An early assessment of sea ice conditions for 2019 is available. 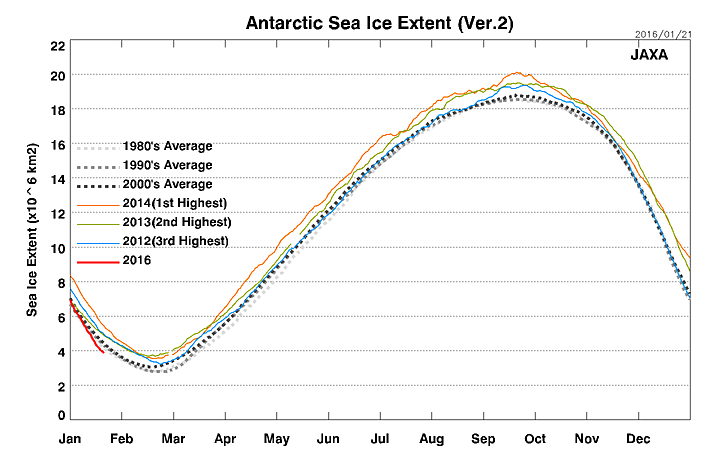 Read about the record minimum Antarctic ice extent for January, and the lack of ice in the Bering Sea. [2018-12-21] New permafrost assessment is available. A permafrost assessment for 2017-2018 is now available in the Cryosphere Now/Assessments section. For the Northern Hemisphere, decreasing permafrost trends occurred in nearly all of the stations with a ten year or longer record. 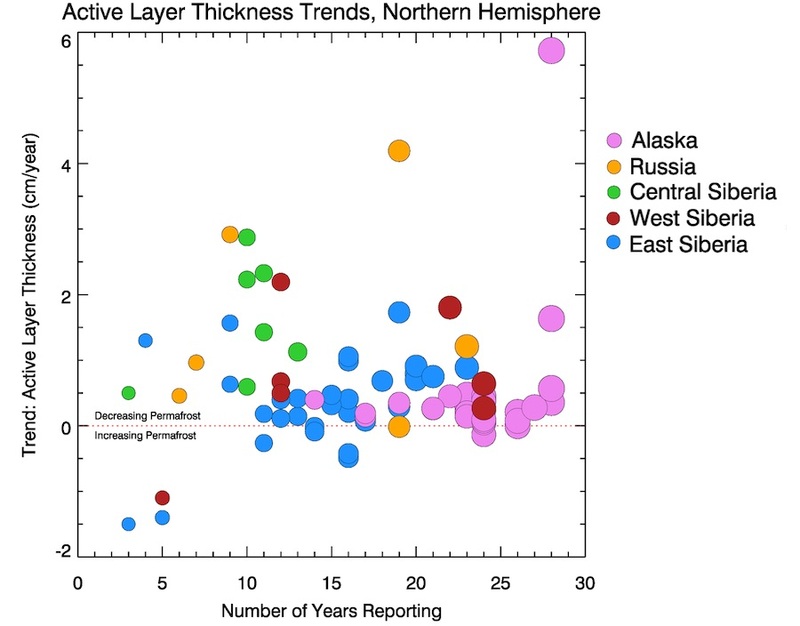 Among current permafrost measurement sites, typical Arctic active layer thickness increases were between 0.45-0.65 cm/year. [2018-12-16] Sixth Session of the GCW Steering Group. 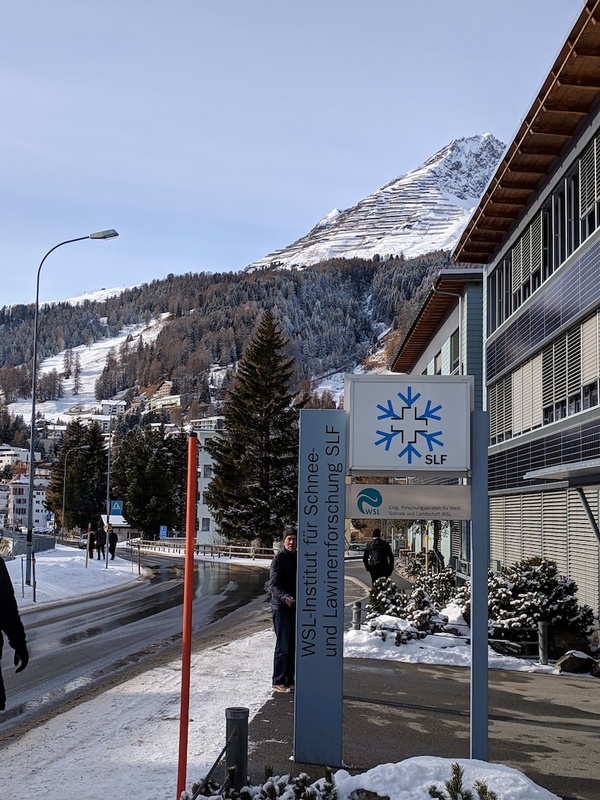 The 6th session of the Steering Group of the Global Cryosphere Watch was hosted by the WSL Institute for Snow and Avalanche Research SLF, in Davos, Switzerland, from 26 to 28 November. This was a "reduced" meeting with only a subset of the Steering Group. The primary goal was to further develop the GCW Preoperational Plan and preparations for the 2019 World Meteorological Congress. See the meeting page for more information. [2018-11-01] GCW is now on Instagram. 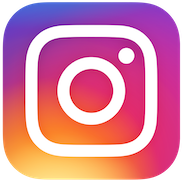 GCW is now on Instagram. Follow us! [2018-10-09] WMO and GCW at CIMO TECO-2018. WMO Secretary General Petteri Taalas laid out plans for organizational reform at CIMO TECO-2018, hosted by Meteorological Technology World Expo 2018. Craig Smith, Environment and Climate Change Canada, discussed GCW and its development of authoritative guides on measurement best practices for cryospheric variables. [2018-08-01] Preliminary 2018 CIMO Guide with Cryosphere Section. 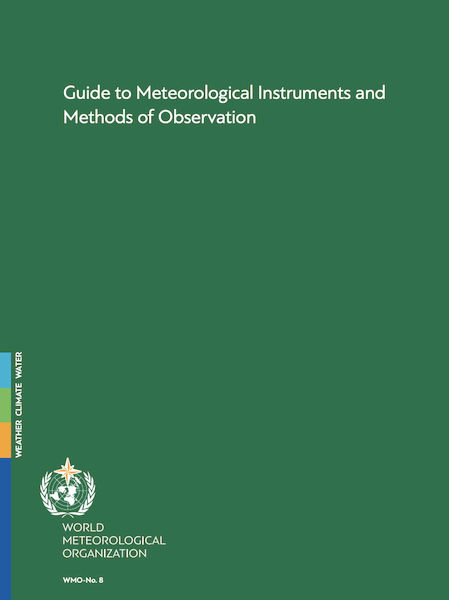 The preliminary 2018 edition of the Guide to Meteorological Instruments and Methods of Observation (WMO-No. 8, the CIMO Guide) is now being reviewed. Of particular note is that the Global Cryosphere Watch community, led by the GCW Best Practices Team, has provided two new chapters: a general chapter on measurement of cryospheric variables and a chapter on snow measurements. Other cryosphere chapters will be provided in future revisions. The CIMO Guide has been the main source of information used by WMO Members to standardize instrument performance and guarantee the quality of observations. It was requested that CIMO put a high priority on the development of standards under the WMO Integrated Global Observing System (WIGOS) framework and regularly update the CIMO Guide. [2018-06-11] Cryosphere trends updated for 2017. 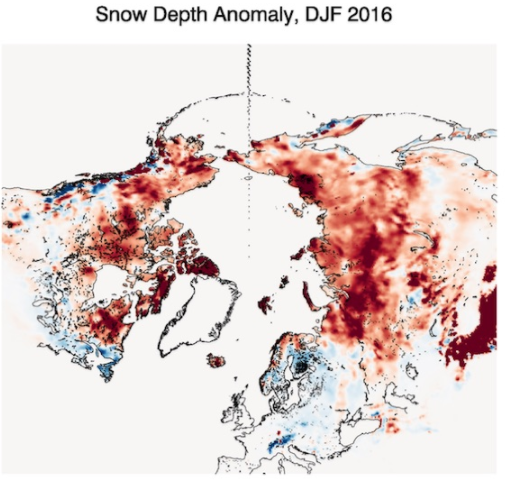 Compared to 2016, Arctic summer temperature is down, September sea ice area and spring snow cover are up; glacial mass balance and Greenland ice sheet mass have increased slightly (but are still very negative). 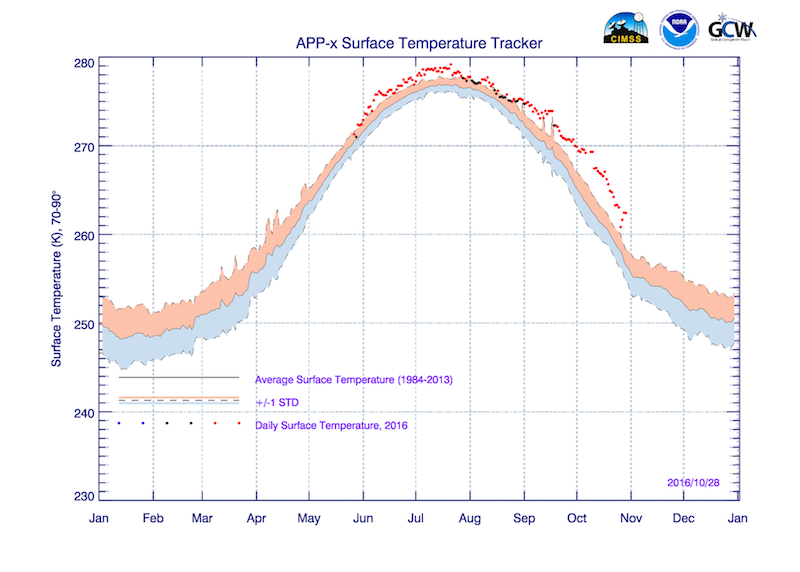 In the Antarctic, surface temperature is up and February sea ice area is down. Read more at http://bit.ly/2Jyf8En. [2018-06-03] 2018 sees close to record maximum snow accumulations over NH and Arctic land. 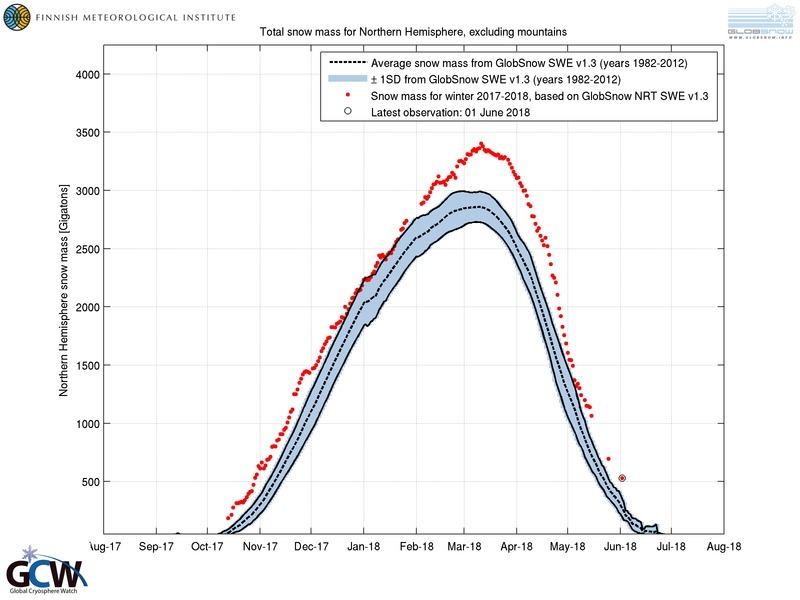 Early 2018 experienced close to record maximum snow accumulations over the Northern Hemisphere and Arctic land areas since satellite passive microwave coverage began in 1979. The 2017/2018 winter has been quite exceptional compared to typical recent winters, and is one of the snowier winters in the period since 1979. See the snow Assessment for more information. [2018-05-20] Unprecedented Bering Sea Ice Season, 2017-2018. 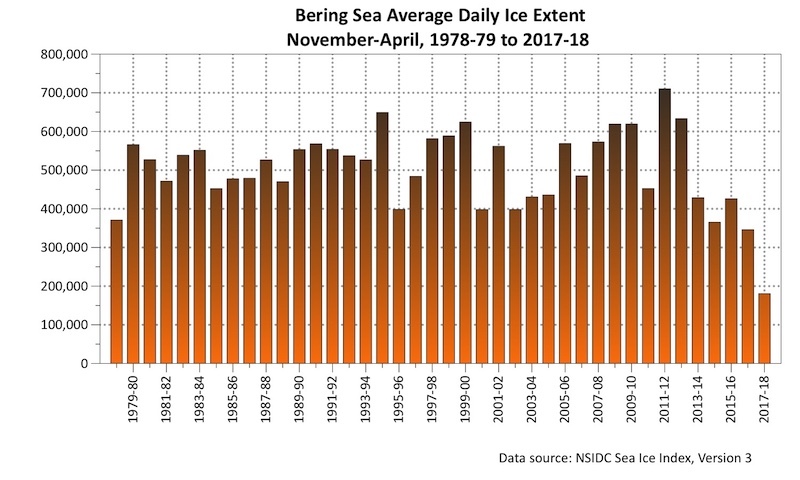 The 2017-18 Bering Sea ice season was unprecedented in the lack of ice, with by far the lowest seasonal maximum and daily average over the 40 years. See the Sea Ice Assessment for more information. [2018-03-26] Orange snow?. Orange snow? It"s possible. See how at https://goo.gl/9Feqwv. [2018-03-25] The Arctic began and ended warmer than usual. The Arctic began and ended warmer than usual. More in the Atmosphere Assessment. [2018-03-06] 38th year of negative glacier mass balance. 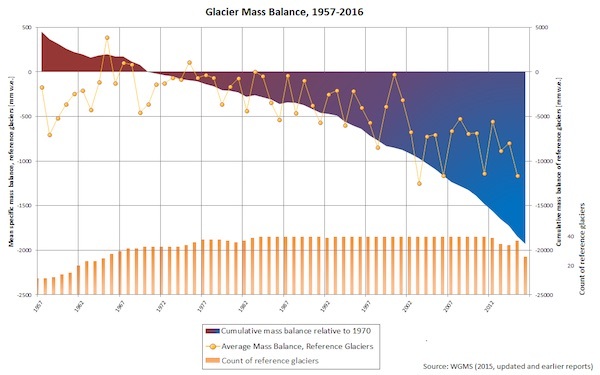 Although there was a slight increase in the overall glacial mass balance in 2017, it will be the 38th consecutive year of negative mass balances globally. Read more on the glacier Assessments. [2018-02-03] Sites are now Clusters. CryoNet Sites are now called "Clusters". The terminology change, approved at the GCW Steering Group meeting in January 2018, was made to avoid confusion, as the word "site" is used interchangeably with "station" in some countries. It is only a name change; the definition is unchanged. See the station-cluster types page for more information. [2017-12-04] GCW Data Protocol for CryoNet is now available. GCW's Data Protocol for CryoNet stations is now available at http://globalcryospherewatch.org/cryonet/dataprotocol.html. The GCW Data Protocol provides initial guidance for meeting the GCW data management objective of ensuring the security, integrity, accessibility and free exchange of data. [2017-10-15] Global Cryosphere Watch (GCW) - Arctic Polar Regional Climate Centres (PRCC) Planning meeting. A joint GCW - Arctic Polar Regional Climate Centres (PRCC) planning meeting was held in September 2017. This meeting was the first formal joint session between GCW and PRCC communities. The meeting resulted in agreements and recommendations to facilitate the implementation of both efforts. Visit the meeting page for more information. [2017-07-16] The Tropical Cryosphere workshop was a success!. GCW held its first Tropical Cryosphere Workshop in Arusha, Tanzania, 4-6 July 2017. The workshop was hosted by the Tanzania Meteorological Agency (TMA). Participants were from Tanzania, Kenya, the Democratic Republic of the Congo, Morocco, Indonesia, Ecuador, Peru, Bolivia, Austria, Iceland, Switzerland, and the United States. Some information has been posted on the meeting page; more will be posted in the coming weeks. [2017-07-15] Larsen C iceberg in Interesting Events; New assessments. 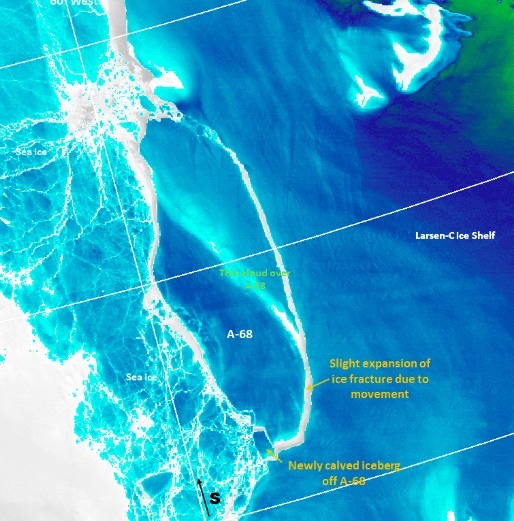 Look at some exclusive satellite imagery of the July 2017 Larsen C iceberg in the Interesting Events section. There is a new assessment for ice sheets and an updated permafrost assessment in the Assessments section. [2017-06-13] WMO Executive Council approves 120 stations. On 15 May 2017 the WMO Executive Council (EC-69) approved 77 CryoNet stations and 43 contributing stations for the GCW surface observing network. See them at http://globalcryospherewatch.org/cryonet/sites.php. [2017-05-12] New assessments available for 2016 snow and permafrost. 2016 assessments are available for snow and permafrost. Thaw depth increases, more and deeper snow in some areas...http://globalcryospherewatch.org/assessments/. [2017-05-01] New assessment page. 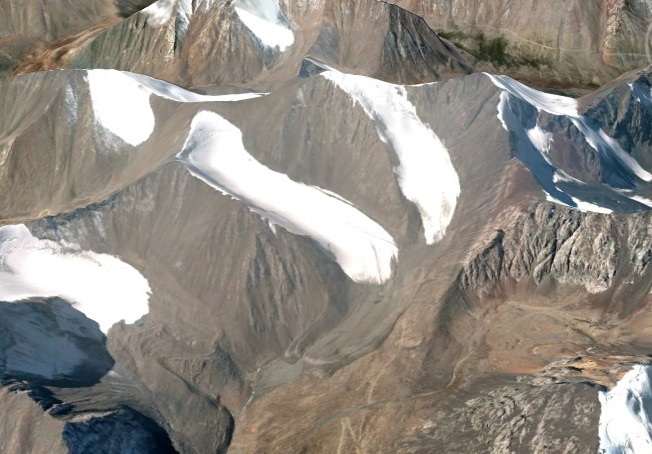 A new assessment page has been added that provides an overview of recent changes across the cryosphere. A "stacked" time series plot shows changes in sea ice extent, snow cover, permafrost thaw depth, glacier mass balance, and ice sheet mass change. Look for it in the Assessment section of the Cryosphere Now. [2017-04-12] Glacier mass balance continues to decline in 2016. 2016 will be the 37th consecutive year of negative glacial mass balances. Read more at in the assessments. [2016-11-14] A warm October results in record minimum Arctic sea ice extent. A very warm September and October across the Arctic Ocean, and particularly around the Beaufort and Chukchi Seas, resulted in a record minimum sea ice extent for October (but not September). Read more in the sea ice assessment at http://globalcryospherewatch.org/assessments/seaice/2016/. [2016-10-02] CryoNet and Best Practices Team meetings, Graz 2016. CryoNet and Best Practices Teams Meeting, 20-24 September 2016, Graz, Austria. GCW held meetings of the CryoNet Team and the Best Practices Team 20-24 September 2016 in Graz, Austria. The meetings were hosted by the University of Graz. 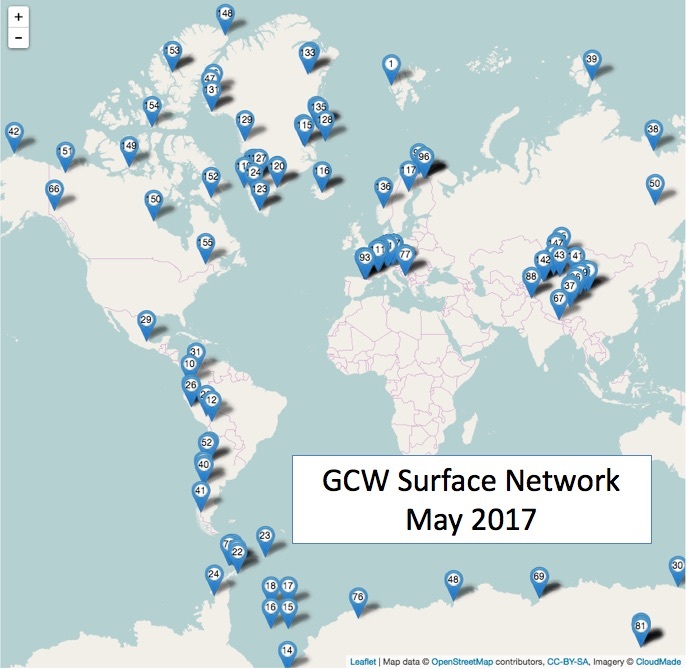 The CryoNet Team finalized the criteria by which surface stations will be added to the GCW network and evaluated many of the proposed sites. The Best Practices Team began the long process of compiling the GCW Guide, which will focus on recommended practices for measuring snow, ice, and permafrost properties, but will also include sections on data and metadata exchange, observational requirements, and integrated products. More information is available on the meeting page. [2016-09-27] New trackers for sea ice temperature, albedo, and thickness. New experimental sea ice trackers have been added to the Cryosphere Now section of the GCW website. Sea ice temperature, albedo, and thickness trackers based on the AVHRR Polar Pathfinder-Extended (APP-x) dataset are available at http://globalcryospherewatch.org/state_of_cryo/seaice/. These are research products that are being evaluated. [2016-04-22] PSTG SAR Data Compendium Released. 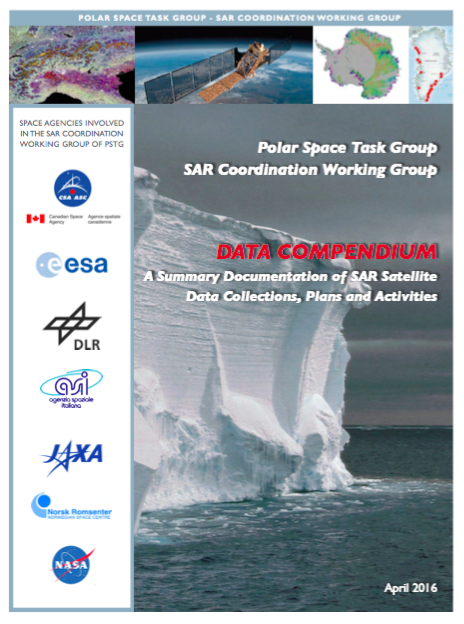 A significant achievement of the WMO Polar Space Task Group (PSTG), a partner to GCW, is the synthetic aperture radar (SAR) Data Compendium from the SAR Coordination Working Group (SCWG). The SCWG coordinated the acquisition of several thousand images over a period of more than two decades, providing a rich and diverse dataset that can be used to examine changes in the polar regions. Read more from the Canadian Space Agency at http://goo.gl/8357oD. [2016-02-17] GCW Project Office Project Manager vacancy. A GCW Office is being created in Geneva, and a Project Manager position is now open. See the announcement at https://erecruit.wmo.int/public/ (vacancy 1956). It"s only open until March 4! 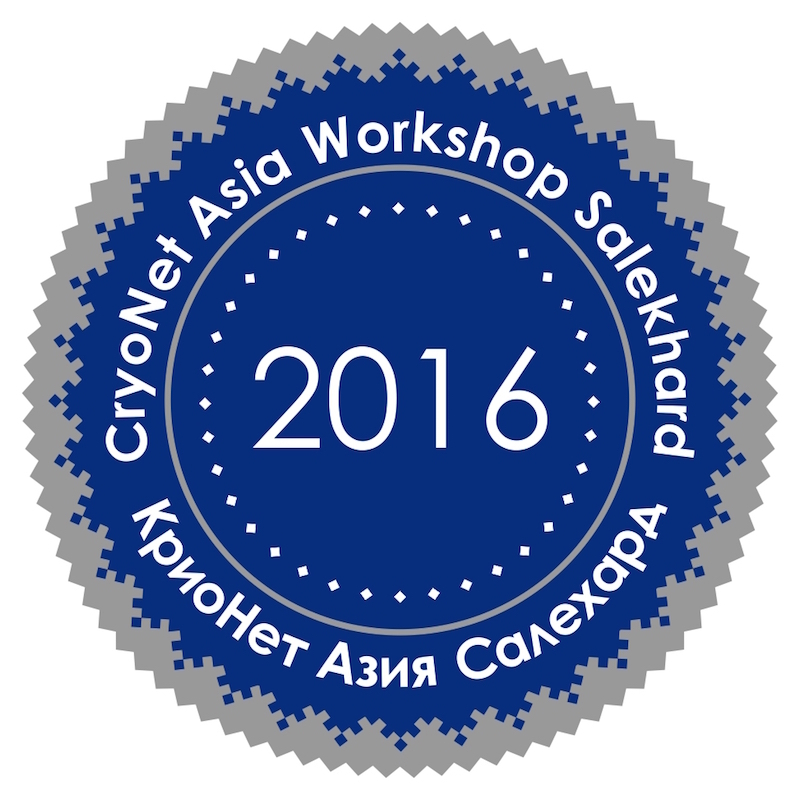 [2016-02-12] Successful 2nd Asia CryoNet Workshop in Salekhard. GCW held its Second Asia CryoNet meeting in Salekhard, Russia, western Siberia, 2-5 February 2016. CryoNet is the core of the GCW surface observing network. The workshop was organized by the Arctic and Antarctic Research Institute (AARI) of Roshydromet and the Administration of the Yamal-Nenets Autonomous Okrug (YaNAO). There were three days of plenary meetings in the YaNAO Administration building and one day of field training on Ob River north of Salekhard. The main objective of the workshop was to develop practical aspects of the implementation of CryoNet in Asia based on the decisions of the Seventeenth World Meteorological Congress (25 May – 12 June 2015). This includes, among others, identifying new stations/sites that could become CryoNet or contributing sites in both terrestrial and marine environments in Asia, reviewing existing observing practices for cryospheric observations and examining advances in measurement techniques, and discussing data policies. There was considerable media coverage of the event, including four of the workshop organizers discussing the cryosphere on a local TV show. Media coverage is listed on the GCW website at http://globalcryospherewatch.org/meetings/salekhard2016/media.html. The workshop was very productive, with more than 20 sites in the "Third Pole" (Himalaya) region and Siberia being proposed as new CryoNet sites. More information is on the meeting page. [2016-01-26] Snowzilla - The Blizzard of 2016. While snow storms happen all the time, this one paralyzed a few major U.S. cities. More information on the January 2016 blizzard is available under Interesting Events. [2016-01-23] CryoNet Station and Site Type Definitions Refined. At the December 2015 CryoNet meeting in Boulder, Colorado, station and site type definitions were refined. The overall structure was simplified. For more information see the figure and visit the CryoNet station/site types web page. [2016-01-23] New sea ice tracker from JAXA-NiPR. A new sea ice tracker from JAXA-NiPR (Japan) has been added to the Cryosphere Now. There is a tracker for each hemisphere. [2016-01-23] The Glossary Keeps Growing. The glossary keeps growing. There are now 2900+ terms from 21 different sources. Check it out! [2016-01-22] Steering Group and Multiple Team Meetings in Boulder. A joint meeting of the CryoNet Team and Portal and Website Teams was held at the University of Colorado, December 7-9 in Boulder Colorado. It was hosted by the National Snow and Ice Data Center (NSIDC). The GCW Steering Committee (GSG) met December 10-11, hosted by the Cooperative Institute for Research in Environmental Sciences (CIRES). The meetings established key steps for the next 1-2 years. More information is available on the meeting page. 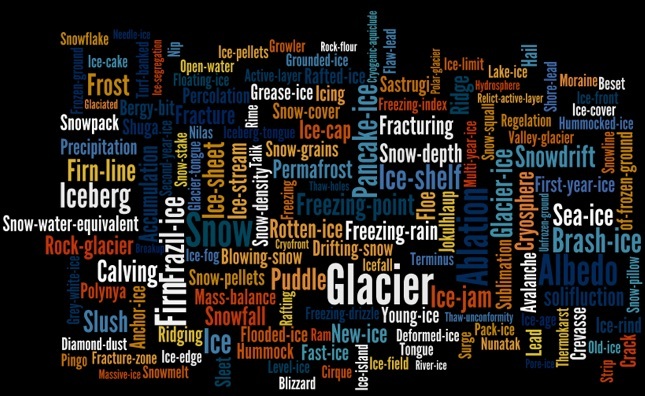 [2015-12-17] The GCW Cryosphere Glossary is growing. Glossary update: Terms from six additional sources have been added to the GCW glossary. More will be added in the coming months. We now have over 2500 terms, about 1500 unique, compiled from 19 different sources! The Terminology Team is making a lot of progress. [2015-09-21] Second SnowPEx Workshop. The 2nd International Satellite Snow Products Intercomparison Workshop was held in Boulder, Colorado, 14-16 September 2015. The objective of the "SnowPEx" project is the intercomparison and validation of hemispheric and global satellite snow products for estimating temporal trends of the seasonal snow cover and assessing their accuracy. In the 1st International Satellite Snow Products Intercomparison Workshop, held at NOAA, Maryland, in July 2014, the community discussed and agreed on methods and protocols for the intercomparison of products and their validation using reference data sets from various environments and surface types around the world. The original snow product intercomparison project was started by the Snow Watch group of the World Meteorological Organization"s Global Cryosphere Watch (GCW) initiative in 2013. 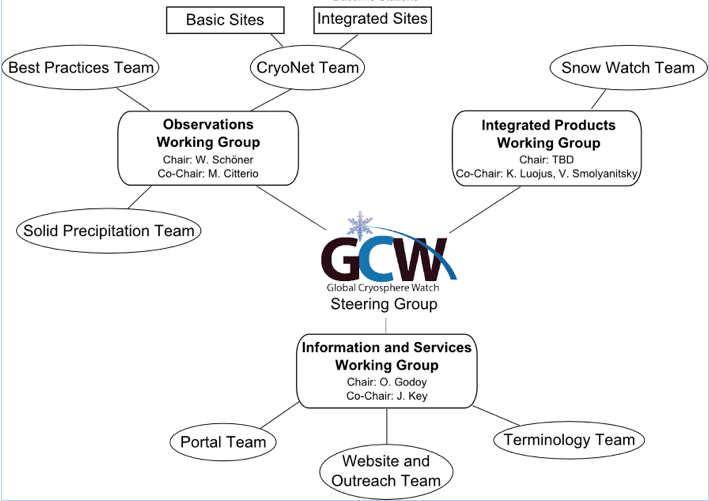 The SnowPEx project grew out of the first GCW Snow Watch workshop in Toronto, Ontario, Canada in January 2013. SnowPEx is funded by the European Space Agency (ESA). Additional information is available at http://calvalportal.ceos.org/projects/snowpex/isspi-2nd-workshop. [2015-06-25] Strong endorsement of GCW by WM Congress. The 17th World Meteorological Congress (Cg-17) agreed that Polar and High Mountain Regions become one of the seven WMO Priorities for 2016-2019, especially to "Improve operational meteorological and hydrological monitoring, prediction and services in polar, high mountain regions and beyond by: (a) operationalizing the Global Cryosphere Watch (GCW); (b) better understanding the implications of changes in these regions on the global weather and climate patterns; and (c) advancing the polar prediction under the Global Integrated Polar Prediction System (GIPPS)". In Resolution 4.2.6(2)/1 (Cg-17) on GCW, Congress decided to mainstream and implement GCW in WMO Programmes as a cross cutting activity and requested that the Secretary-General ensure, to the extent possible within available resources, management of, and provide support to, the implementation of GCW and to establish a GCW Project Office. Congress agreed that the GCW Implementation Plan should be the guiding document for the implementation of the GCW. Congress also agreed that an immediate priority for GCW is to establish CryoNet, which is one of the four WMO Integrated Global Observing System (WIGOS) component observing systems and agreed on 36 CryoNet sites that will be used for the pre-operational testing phase. [2015-05-31] Successful WMO Congress Polar Panel Discussion. The 17th World Meteorological Congress was held in Geneva, Switzerland, May 25 - June 12, 2015. A special panel discussion on WMO"s polar activities was held as a side event on May 28. The panel discussion included the activities of the Global Cryosphere Watch (GCW), the Year of Polar Prediction (YOPP), and other activities of the WMO Executive Council expert panel on Polar Observations, Research, and Services (EC-PORS). It was very well attended, with over 70 participants from around the world, including the directors of many meteorological service agencies. 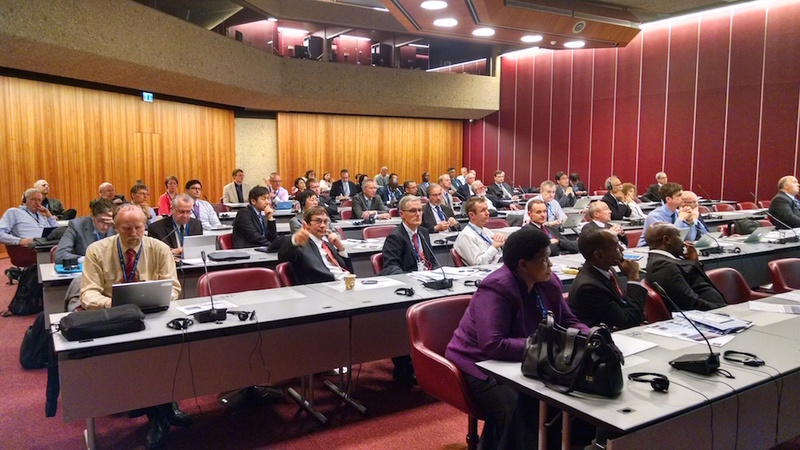 [2015-05-18] 17th WMO Congress and GCW. The 17th World Meteorological Congress will be held in Geneva, Switzerland, 25 May - 12 June 2015. GCW will be reviewed by Congress. 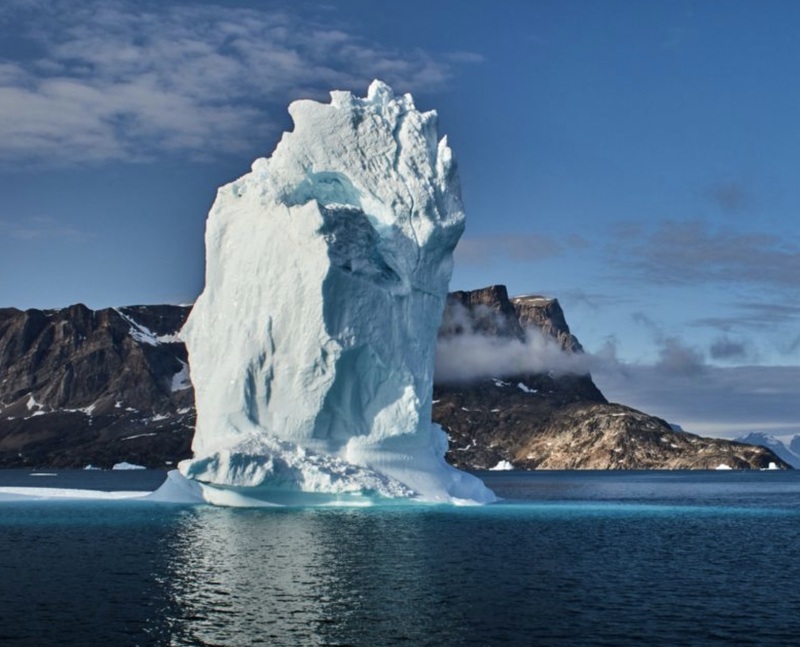 The Executive Council expert panel on Polar Observations, Research, and Services (EC-PORS), which oversees GCW, will hold a Round Table Discussion on 28 May, 13:30-14:30. GCW and other polar activities will be discussed. [2015-05-18] CryoNet is taking shape!. CryoNet is taking shape! After workshops in Vienna, Beijing, and Santiago de Chile, many stations have been proposed and preliminarily accepted, to be approved by WMO Congress in June 2015. [2015-05-11] GCW Portal (Catalogue) will be down briefly on 12 May 2015. The GCW Data Portal (Catalogue) will be unavailable briefly on Tuesday, 12 May 2015 for maintenance. It is expected to be down for about 30 minutes between 09:00 and 12:00 Central Europe time. Downtime could be longer. [2015-05-08] Foreign Press Center Briefing on Arctic Climate Change. 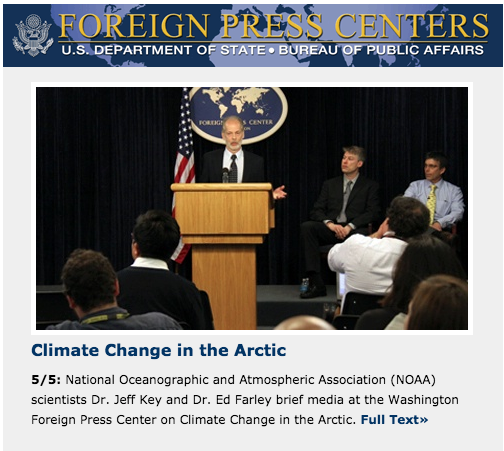 Jeff Key and Ed Farley, both from NOAA, gave briefings on two aspects of recent changes in Arctic climate at the U.S. State Department"s Foreign Press Center (FPC) in Washington, D.C., May 5, 2015. Key spoke on the use of satellites in detecting and quantifying changes in the Arctic climate system. Farley spoke about the impact of a retreating sea ice cover on Alaska fisheries. The briefing was attended by nine journalists from around the world, with two additional foreign journalists viewing via video-conference from the NY Foreign Press Center, and questions from US, UK and Canadian journalists who livestreamed the conference and emailed questions. A video of that briefing is available at http://fpc.state.gov/ (at the time of this report) or http://bcove.me/dtuso7fk. CBC/Radio Canada posted an article shortly after the briefing (http://www.cbc.ca/news/politics/melting-arctic-ice-changing-weather-patterns-scientists-say-1.3061988). [2015-03-13] Steering Group, CryoNet Team, and Portal Team meetings. GCW held two meetings in Copenhagen, Denmark, 19-23 January 2015. The CryoNet Team and the Portal and Website Team worked on issues of satellite product intercomparisons and inventories, product metadata, portal interoperability with various data centers and information systems, and the CryoNet site application form. The GCW Steering Group met for higher-level discussions of GCW activities, progress, and plans. The meetings were hosted by the National Geological Survey of Denmark and Greenland. [2015-03-13] GCW Team structure revised. After very productive GCW Steering Group and CryoNet Team meetings in Copenhagen (January), the GCW team structure and surface network site types were revised. More information is on the website. [2014-11-09] First South America CryoNet workshop. The 1st CryoNet South America Workshop was held 27-29 October in Santiago, Chile, with the attendance of 65 participants from 16 countries. The Workshop was sponsored by the World Meteorological Organization (WMO) through the Global Cryosphere Watch (GCW) initiative. Co-sponsors included the Ministry of Foreign Affairs of Chile; the University of Magallanes, Chile (UMAG); the Chilean Weather Service (DMC); the Chilean Water Directorate (DGA); the University of Talca, Chile (UTAL); and the company Geoestudios, Chile. 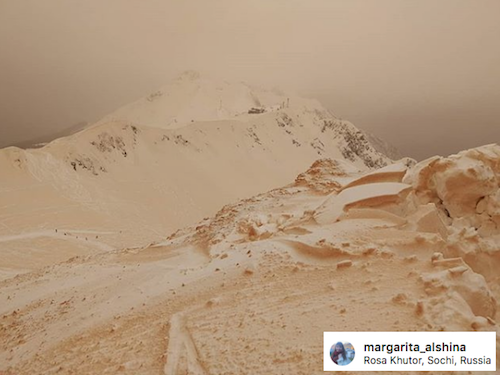 It was concluded that systematic long-term monitoring of the cryosphere is critically needed in Latin America, especially in view of the drastic changes experimented by snow and ice masses at a continental scale. In this regard CryoNet Latin America will provide a key contribution to the global CryoNet initiative. See the meeting page for more information. [2014-07-25] SnowPEX Snow Product Intercomparison Workshop. The first International Satellite Snow Product Intercomparison and Evaluation Experiment Workshop (SnowPEX) was held in College Park, MD, July 21-23, 2014. SnowPEX is an international collaborative effort, funded by the European Space Agency (ESA), aiming to intercompare and evaluate satellite-based seasonal snow cover products of hemispheric to global extent in order to assess their accuracy, resolve possible discrepancies and elaborate guidelines for further improvement. The workshop was hosted by NOAA. 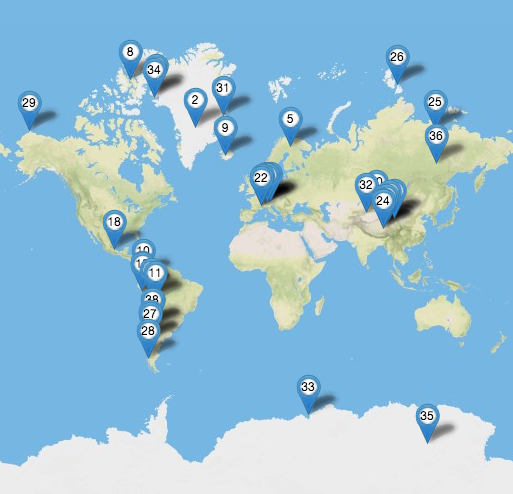 The SnowPEX project is an extension of the "Snow Watch" intercomparison project initiated by the World Meteorological Organization"s Global Cryosphere Watch (GCW) in 2013. More information on SnowPEX is available at http://calvalportal.ceos.org/projects/snowpex. [2014-04-29] CryoNet Team and Steering Group meetings, Davos. Very productive CryoNet Team and GCW Steering Group meetings were held in Reykjavik, Iceland, the week of 20 January 2014. The meetings were hosted by the Icelandic Meteorological Office (IMO). Arni Snorrason was selected as the Steering Group Chair; Barry Goodison was selected as the Vice-Chair. These positions were approved by the Executive Council expert panel on Polar Observations, Research, and Service (EC-PORS) in Wellington, New Zealand in February. [2014-01-09] Interim Advisory Group meeting in Reykjavik, 23-24 Jan 2014. A GCW interim Advisory Group meeting will be held in Reykjavik, Iceland, 23-24 January 2014. [2014-01-09] A CryoNet Team meeting, Reykjavik, 23-24 Jan 2014. 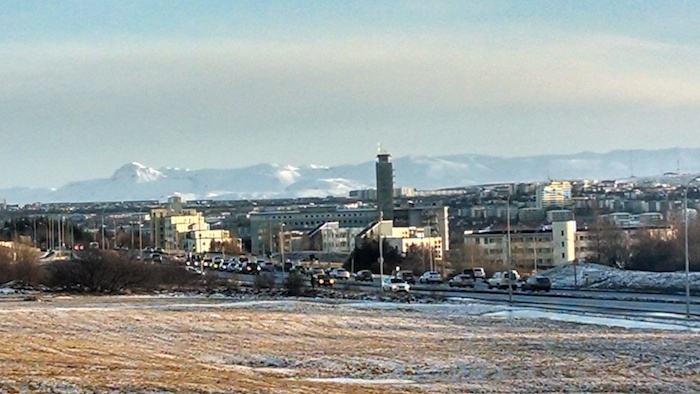 A CryoNet Team meeting will be held in Reykjavik, Iceland, 20-23 January 2014. [2013-12-10] Asia CryoNet Workshop develops a foundation for unified measurements in the region. The World Meteorological Organization held its First Asia CryoNet meeting in Beijing, China, 2-5 December 2013, hosted by the China Meteorological Administration (CMA). 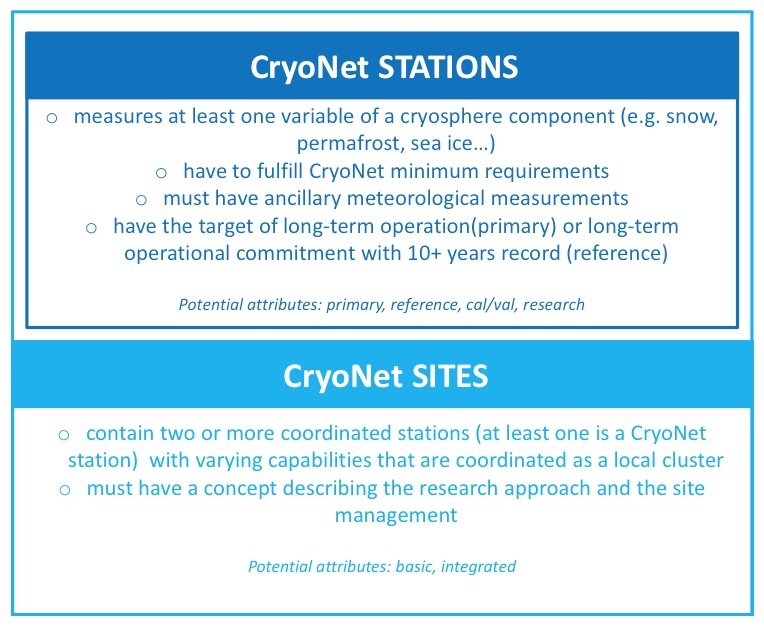 CryoNet is the surface-based network of WMO"s Global Cryosphere Watch (GCW) program. The focus of this meeting was snow and ice measurements in the "Third Pole" (Himalaya) region. Participants were from China, Pakistan, India, Japan, Russia, Kyrgyzstan, Kazakhstan, Tajikistan, Uzbekistan, USA, Canada, Austria, Italy, and Switzerland. The meeting created a foundation for unified measurements of snow and ice in the region. More information is available on the meeting page. [2013-11-27] Successful WGMS Summer School. 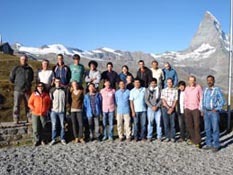 The World Glacier Monitoring Service"s (WGMS) Summer School on Mass Balance Measurements and Analysis 2013, 2-7 September 2013, was a great success. The Executive Summary is available here and on the . GCW was one of the sponsors. [2013-06-17] Barry Goodison awarded the 2012 Patterson Distinguished Service Medal. 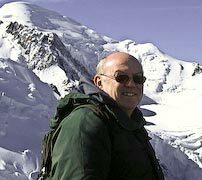 Barry Goodison, the "father of GCW", has been awarded the 2012 Patterson Distinguished Service Medal. The Patterson Medal is awarded to residents of Canada for distinguished service in the field of meteorology. The award was established in honour of Dr. John Patterson, eminent meteorologist and Controller of the Meteorological Service of Canada from 1929 to 1946. [2013-06-16] WGMS Summer School on Mass Balance Measurements and Analysis 2013, 2-7 September. The World Glacier Monitoring Service (WGMS) will hold a Summer School on Mass Balance Measurements and Analysis 2013, 2-7 September 2013 in Switzerland. The course will be restricted to about a dozen participants from the Andes and Asia who are involved with ongoing mass balance programmes in their region. The participants are trained in both field and office work by an international team of experts in glacier monitoring and capacity building. GCW is one of the sponsors. [2013-05-24] Third Meeting of the WMO Polar Space Task Group, 22-23 May 2013, Paris, France. The Third Meeting of the WMO Polar Space Task Group (PSTG) was held 22-23 May 2013 in Paris, France. It was hosted by CNES. [2013-03-26] The new SWE Tracker is showing anomalously high snowfall in the Northern Hemisphere this winter. It has been a snowy winter in the Northern Hemisphere! The new Northern Hemisphere SWE Tracker is showing anomalously high snow cover relative to the long-term mean. The GCW Snow Watch Group, in collaboration with the Finnish Meteorological Institute (FMI), has created a daily Northern Hemisphere SWE Tracker. The SWE Tracker provides a quick look at the current snow water equivalent compared to a long-term climatology. It is available on the Cryosphere Now Snow page. [2013-03-15] Fourth Meeting of the WMO Panel on Polar Observations, Research, and Services, 13-15 March 2013, Lanzhou, China. 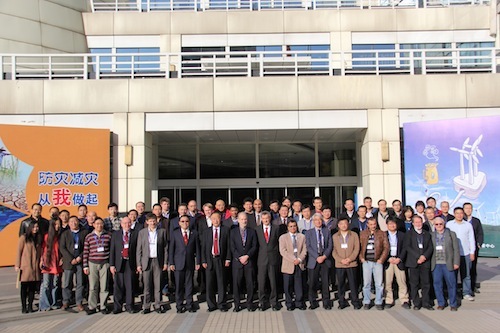 The Fourth Meeting of the WMO Panel on Polar Observations, Research, and Services (EC-PORS) was held 13-15 March 2013 in Lanzhou, China. More information is available on the EC-PORS website. [2013-03-11] The GCW Implementation Plan is now available. Version 1.0 of the GCW Implementation Plan is now available. See the Documents section of this website.